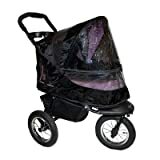 Found 14221 Health Supplies Cat Products. 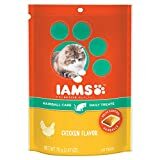 Keep your cats at their best with IAMS PROACTIVE HEALTH Adult Healthy Digestion Dry Cat Food with Chicken and Turkey—a chicken-first recipe designed to help with your cat’s sensitive stomach. For outdoor or indoor cats, this cat kibble is formulated with highly digestible proteins (chicken is the #1 ingredient) to help with the long-term digestive health of cats with sensitive stomachs. Plus, its tailored fiber blend, with prebiotics and beet pulp, supports your cat’s ability to absorb nutrients. Part of a complete and balanced diet, this kibble delivers flavors cats naturally desire. If you’ve been struggling to find the right cat food to help with your cat’s sensitive stomach, get your paws on this—and nourish your cat with IAMS Healthy Digestion Dry Cat Food. 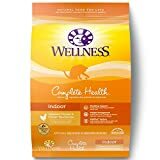 Wellness complete health indoor health is a complete and balanced solutions diet of high quality proteins and healthy grains with a focus on the nutrition for cats that live indoors. 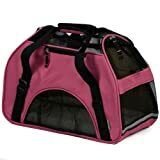 These cats tend to gain weight (lifestyle is more sedentary), experience dry skin (from continued exposure to indoor air and heat), and have increased hairballs (from constant grooming and hair loss from dry skin). this diet was created with specific amounts of nutrients for cats that lounge more, groom often and live indoors. Keep your cats at their best with IAMS High Protein Adult with Chicken & Salmon Dry Cat Food—a chicken-first recipe designed to give your active cats the protein-rich, flavorful food they naturally require. For outdoor or indoor cats, this cat kibble is made from high quality proteins like chicken and salmon (chicken is the #1 ingredient) for healthy vitality and healthy energy. Plus, its tailored fiber blend includes prebiotics and beet pulp to support your cat’s digestive health. 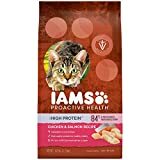 If you’re looking for a high protein cat food with chicken or salmon, get your paws on this—and feed your cats’ carnivorous nature, keeping them ready to pounce, with IAMS High Protein Dry Cat Food. Are your cats fighting or showing tension in your household? FELIWAY products are a clinically proven, drug-free solution to help alleviate many unwanted behaviors cat owners often deal with. FELIWAY MultiCat sends “harmony messages” to cats and restores harmony between cats living together. By mimicking the natural feline appeasing messages (pheromones), FELIWAY MultiCat helps your cats live in harmony and avoid tension, conflict and fighting. Cat owners saw a 70% reduction in conflict in 3 weeks. 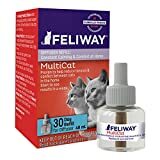 Use FELIWAY MultiCat refill vials along with the FELIWAY MultiCat diffusers (sold seperately) if you have 2 or more cats living together and if they shows signs of tension like chasing, blocking, staring. 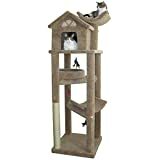 Use FELIWAY MultiCat in the rooms where your cats spend the most time. FELIWAY MultiCat Refill vials include one refill vial (diffuser head sold seperately). It is recommended to replace the refill every 4 weeks, even if a small amount of liquid remains in the vial (the vial will never be completely empty). 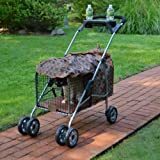 Cats are natural carnivores who instinctively crave protein-rich foods in nature, but regular dry food falls short when it comes to satisfying cats who want a tender, meaty texture at mealtime. This inspired Purina ONE nutritionists and veterinarians to research what cats get from their diet in nature. 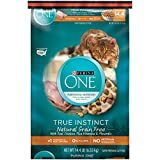 Purina ONE True Instinct Natural Grain Free With Real Chicken Plus Vitamins & Minerals makes a healthy difference you can see, with natural nutrition that satisfies your cat and helps support lifelong whole body health. Gauranteed Analysis: Crude Protein (Min)...35.0%, Crude Fat (Min)...14.0%, Crude Fiber (Max)...2.0%, Moisture (Max)...12.0%, Linoleic Acid (Min)...1.4%, Calcium (Ca) (Min)...1.0%, Phosphorus (P) (Min)...0.9%, Zinc (Zn) (Min)...150mg/kg, Selenium (Se) (Min)...0.35mg/kg, Vitamin A (Min)...10,000 IU/kg, Vitamin E (Min)...100 IU/kg, Taurine (Min)...0.15%, Omega-6 Fatty Acids* (Min)...1.5%. *Not recognized as an essential nutrient by the AAFCO Cat Food Nutrient Profiles. Ingredients: Chicken, Poultry By-Product Meal (Source of Glucosamine), Pea Starch, Cassava Root Flour, Soybean Meal, Animal Fat Preserved with Mixed-Tocopherols, Soy Protein Isolate, Dried Egg Product, Pea Protein, Canola Meal, Dried Yeast, Animal Liver Flavor, Soy Protein Concentrate, Chicken Meal, Glycerin, Phosphoric Acid, Calcium Carbonate, Salt, Potassium Chloride, L-Lysine Monohydrochloride, Sodium Bisulfate, Taurine, Choline Chloride, Vitamins [Vitamin E Supplement, Niacin (Vitamin B-3), Vitamin A Supplement, Calcium Pantothenate (Vitamin B-5), Thiamine Mononitrate (Vitamin B-1), Riboflavin Supplement (Vitamin B-2), Vitamin B-12 Supplement, Pyridoxine Hydrochloride (Vitamin B-6), Folic Acid (Vitamin B-9), Vitamin D-3 Supplement, Biotin (Vitamin B-7), Menadione Sodium Bisulfite Complex (Vitamin K)], L-Cysteine, Minerals [Zinc Sulfate, Ferrous Sulfate, Manganese Sulfate, Copper Sulfate, Calcium Iodate, Sodium Selenite], DL-Methionine. A-4152. Caloric Count: 4134 kcal/kg, 359 kcal/cup AAFCO Statement: Animal feeding tests using AAFCO procedures substantiate that Purina ONE True Instinct Natural Grain Free With Real Chicken Plus Vitamins & Minerals provides complete and balanced nutrition for maintenance of adult cats. 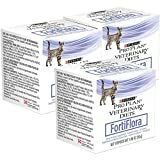 Purina FortiFlora Feline Nutritional Supplement contains the beneficial microorganisms found naturally in your cat's digestive system to help manage and shorten episodes of diarrhea. Common causes of diarrhea for cats and kittens include food changes, antibiotic therapy and environmental stress. Stop chasing your dog or cat around the house with a toothbrush! Perio Support dental powder is easy to administer and works organically on the bacteria in your pet’s mouth, gums and digestive tract to fight plaque buildup and freshen breath. According to the American Veterinary Dental Society, 80-85% of all pets have periodontal disease. Perio Support can help.Perio Support is designed for use in between scheduled cleanings to help maintain clean teeth and fresh breath. It is formulated to help control plaque formation and to support gum health. Perio Support includes: natural zeolites, cranberry, a source of antioxidants and bioflavonoids that support reduction of undesirable bacteria; taurine and zinc, which work together to support gum tissue health and strength; and beneficial, direct-fed microbials lactobacillus acidophilus and enterococcus faecium, which help restore microbial balance in the mouth and displace unhealthy plaque-causing bacteria. Offer your discerning cat the gourmet tastes she loves with Purina Fancy Feast Gravy Lovers Poultry & Beef Feast Collection wet cat food. 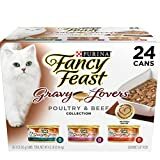 Chicken, turkey and beef give this collection the savory taste she craves, and the rich gravy in every serving of this canned cat food is sure to have her licking her dish clean. Small, delicate bites slow-cooked to perfection deliver a tempting texture, and the assortment of flavors makes it easy to keep your cat's curiosity piqued at mealtime. With essential vitamins and nutrients to support her overall health and wellness, this gourmet wet cat food lets you feel good about the foods you put into her dish. Offer up a different delectable flavor at each feeding, and show your feline friend just how important she is to you and your family with this collection of mouthwatering Fancy Feast Gravy Lovers cat food cans. She shouldn't have to wait for dinner, and you shouldn't have to, either. Get Purina Fancy Feast wet cat food fast from Amazon.com. Satisfy your cat's craving for chicken flavor and help eliminate hairballs with IAMS PROACTIVE HEALTH Hairball Care Daily Treats for Cats. 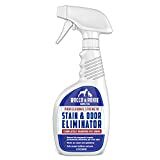 This tasty cat treat with health benefits contains a patented hairball control formula to help reduce hairballs and support a healthy digestive tract. Best of all, IAMS Cat Treats feature a crunchy shell and an irresistibly soft center for a delightful cat snack experience. 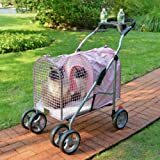 Your adult cat will adore the tasty poultry flavors in this functional cat treat, and you will like that each snack for cats delivers essential protection they need for lifelong wellness. IAMS Cat Treats are a delicious way to prevent, protect and support your adult cat.